There are not a lot of fandoms that would call to me. My friend Umiko once asked me to write her into Harry Potter, but probably a week later, she was writing herself into something Tamora Pierce, so that never went anywhere. Generally, when I want to write fan stuff, it’s because I love the world, the premise, or some vague or abstract concept introduced in the original work. I liked the soldier Gardens (and the ease with which I could invent theme jargon) go Final Fantasy 8, even though the story was incomprehensible and the characters unrelatable cardboard. One that I did do something with, though I didn’t actually write anything, was for Kingdom Hearts. At first, it was sort of like what I’m sure everyone did–pick a couple of favourite characters from video games and Disney movies. That was the drive of the original game, wasn’t it? I had played the game a lot, so I found myself thinking inside the constraints raised in the game, both in mechanics and in storytelling. And marketing, a little. Re: mechanics, I constrained my “party” to three people. 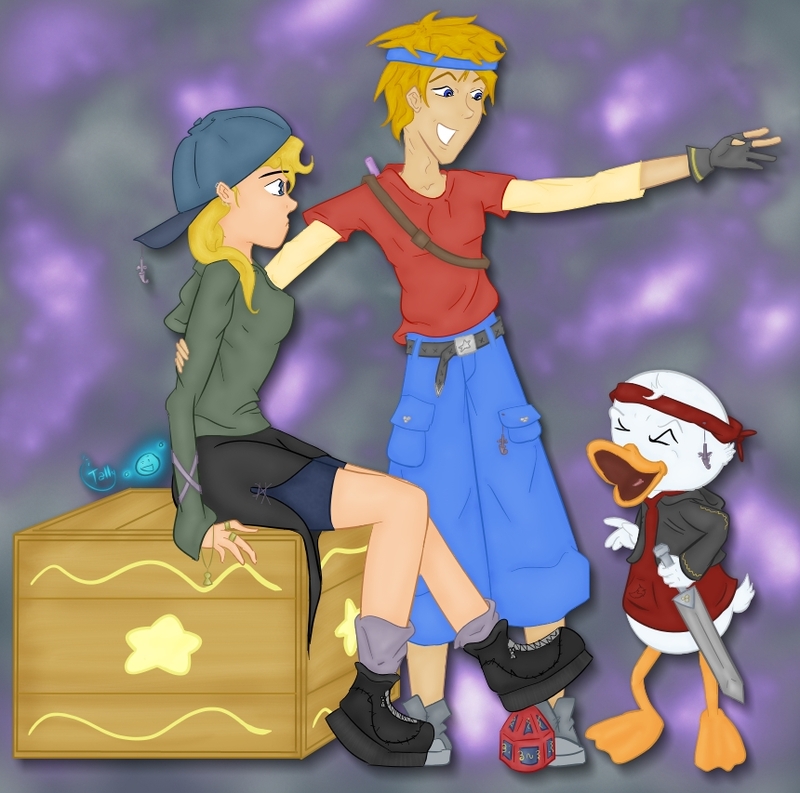 The central and original protagonist, a video game character (from an Enix-published game, which is really grasping when it comes to the SquareEnix distinction) and a Disney character. Mine were Magnet, my original thief character, Will of Illusion of Gaia (post-game’s-end), and Huey Duck. Another thing that came from the mechanics of the game was that, although it only really shows up in the picture, items are represented by a sort of Faberge-meets-Rubik’s-cube thingamabob. The crate was really just the only nod to background I was willing to draw, but those are in the game as well. I used one location–the hub town called Traverse Town, which is kind of a non-place where things just ended up when worlds ended. And I used the concept of travelling between established worlds on a quest to find someone. Now that I’m thinking about it again, and looking at it, it looks like I used a lot of elements in the game. Huey, for example. Each character had a backstory and an arc of development. In the game, Donald’s nephews had a shop. I went with that. Huey worked himself up into preparing for journey to look for his uncle, leaving the shop with his brothers, when he caught a thief in the shop. He didn’t want to go by himself, so he traded his silence about the break-in for her assistance on his trip. Magnet wound up in Traverse Town after her world ended and became a thief to survive. She intended to just drop Huey like a stone once he had her out of Traverse Town, but he foiled this plan by making magic tokens that would transmit their locations between each other and send out an alarm if they were ever on different worlds. Before they could leave Traverse Town, they were beset by one of the many random attacks by Heartless, and saved by a Jack of All Stats warrior–Will. He was as homeless as either of the others, and insinuated himself into the party by being amiable and knowing a bit more about what was going on. No idea why I never wrote this. Discomfort over the concept? Or maybe, considering when I came up with this, I was in the middle of writing some novels and I think I left the country. Lately, I’ve found myself doing a lot of accidental reading. I do not commonly consume any kind of fanfiction, nor do I concern myself with any of the actual text of Twilight (haven’t tried to read it in ages). But I read tropes when I’m stuck somewhere and don’t have the energy or time to find my place in a book. That’s one of the places where I reach my accidental reading. I found some Twilight fanfiction that had the express purpose of making fun. The book bored me, I can relate. But some of the people poking fun are even worse. Before I get started though, I want to explain what I mean by my post title. An angry parody is, in my opinion, a parody that hints at a list of ills that the fan/anti-fan has with the original work. They are each addressed, often with a heavy hand. And a person who has an agenda or wishes to attack details in the original, is more likely to accomplish these petty goals than to write something interesting. The (possibly famous) fic “If Bella Were Sane” starts out well, rather interesting if formatted quite poorly. It’s a short fanfic, so I suppose it’s too much to expect more than a brief snippet for an entire day’s fictional diary entry. And they did get longer. They also got further away from the goal of “improving” the original story. Given the missive, “rewrite Twilight or otherwise retell the events as if Bella were not a manipulative sociopath,” I would think that some of the events would actually have to change. Why can’t the Sane!Bella have argued with her friends? Teenagers do that. It doesn’t have to be a good reason to fight. She could have also stayed behind to pay for something and then gotten lost. It’s not that complicated. When you’re actually using the phrase, “somehow disappeared…” I don’t wish to finish that thought. This same piece also seems completely unaware of the fact that Bella already knew Jacob before she moved to Forks. I didn’t even finish the book and I know that. Maybe it isn’t necessary to read a work you intend to parody, but if you get something like that wrong, people who are better acquainted with the original work will look down on you. The other parody/rewrite I read is a little more illustrative of what I think made both of these fics fail to different degrees. Luminosity, dubbed a “re-imagining” is, sad to say, even more painfully boring than Twilight. Its premise, rather than Bella simply being “sane”, is that Bella is introspective and self-examining. Unfortunately, the story is quite clearly a third party catechisation. It never sounds like a first person account, despite the use of the Almighty I. Her behaviour is being analysed and commented on by someone else using a blank character. She is also still a Mary Sue in Luminosity. I gag whenever I read stories about a character who fills up notebook after notebook. You can’t even defend that it didn’t come from you, writing a character who is obsessed with writing. I know it’s impossible to turn Twilight into a real story without giving Bella hobbies and interests, but writing does not lend itself well. Something that you can slip in without much upset would suit so much better. One of the few flashes of character I saw in what I managed to read was excitement over owning a vehicle, and I think she restores a motorcycle. Having seen a rewrite that failed worse than the original, I feel a deeper appreciation for successful parodists, and even the original work in this case (did not think that would happen). It’s not easy. And I’ve probably rambled on enough and annoyed someone or everyone. Time to wonder why the Garrett Files and the Dresden Files are like twins separated at birth.